A personalized gift is a treasured gift. 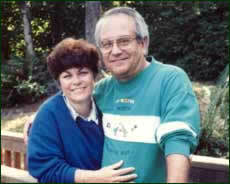 We are Max and Darlene Miller, the owners of Names And More. We have been in the personalized gifts business for 25 years and the names business for 14 years. We have over 220,000 names in our database. You would think that we have every name covered, yet every day new ones come up. We love the origin of names business! We could speak volumes of knowledge when it comes to naming trends. Ethnic and biblical names remain popular. Our global society embraces diverse ethnic names like Raoul and Mei Ling, as well as, biblical names such as Adam, Hanna, Rachel, and Jacob. Celebrity names rise and fall in popularity just like the stars themselves. Movies, books and video games have made fashionable countless names above and beyond Tammy (or Tami), Jason and Kimberly. We have the satisfaction in knowing that with each name meaning gift, we are making someone feel special. Personalized gifts--especially name meanings--have that effect on people. We've seen it first hand again and again. Our gifts make a difference and we're proud of it. For example, it was Christmas 2001 and Names And More pre-arranged a visit to a local home for abused and abandoned children. Each child was given his/her own name meaning certificate. To the children living in a world of chaos and uncertainty, it was the one thing they could call their own. We want you to tell your friends and family about Names And More and to feel comfortable here so you will return again and again. We will never sell or release your e-mail address or name, address, phone number, or credit card information to a third party, vendor, or anyone outside of our company. The personal information that you provide during the ordering process is automatically encrypted so only we can read it. We are committed to keeping your personal information safe and guarantee you 100% satisfaction. Names And More creates memories that last a lifetime. We thank you for letting us be a part of your life. Pssst. Yes, our name meanings really describe us well. Click here for your free sample names meaning.